Between 13 and 15 September, PRI’s Central Asia office hosted an International Symposium on the prevention of violence against children in closed institutions in Central Asia in Astana, Kazakhstan. Around two hundred delegates attended from Kazakhstan, Kyrgyzstan and Tajikistan – penitentiary staff, judicial personnel, police, representatives from various child rights organisations (state and NGOs), as well as representatives from government agencies and non-governmental organizations from New Zealand, Norway, Great Britain, India, Georgia amongst others. The Symposium marked the end of a three-year project, funded by the European Union and implemented by PRI with national partners in the three countries, which aimed to achieve the progressive elimination of violence against children in closed institutions. Over the first two days, there were focused sessions on topical issues relating to the treatment of children in conflict with the law, with workshops for penitentiary staff, judiciary, police and for child rights institutions. On the third day, delegates gathered for a conference, and were joined by senior officials from the Kazakh, Kyrgyzstan and Tajik Governments, non-governmental organisations, and a number of donors from different embassies. A key part of the project was to document children’s experience of violence in detention and other closed institutions in the region and to improve capacity and methodology of monitoring bodies to assess and challenge it. The results of the research (published in two reports – Voice of the Child 2014 and 2015) were presented at the conference. 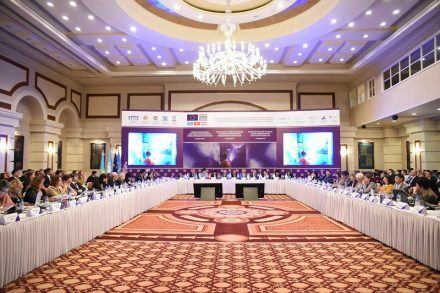 The third meeting of the Central Asian Network of Ombudsmen (Central Asian Network – Ombudsman CAN) was also held during the Symposium. The Symposium was co-organised with the Ombudsman of the Republic of Kazakhstan, Akykatchy (Ombudsman) of the Kyrgyz Republic, the Committee on Legislation and Judicial-Legal Reform of the Mazhilis of the Parliament, Supreme Court, Ministry of Education and Science, as well as local UN offices – the United Nations Office on Drugs and Crime and the Office of the UN High Commissioner on Human Rights. This project has had considerable success in bringing about reforms to provide better protection for children in the region. For example, the Government of Kazakhstan is currently working on new child rights legislation, which will introduce measures to protect children in contact with the law. Legislation which restricts the use of solitary confinement was passed in 2015 in both Kazakhstan and Kyrgyzstan, following advocacy and assistance from PRI and its partners on this project. The Government of Tajikistan is considering legislation to introduce measures to ensure separation of children and adults in detention, another key aim of the project. More about the project and its results can be found in the mid-term evaluation. A final evaluation will be published soon.